Salvage businesses and recycling centers require non-corrosive structures, and ClearSpan creates the most durable, corrosion-resistant, cost-effective structures that can stand up to any environment and are easy to expand or relocate. Our salvage buildings utilize a clear span design that features no support posts and plenty of clearance, so there is no interference with forklifts, racks, loaders, conveyors or any other heavy machinery. While many salvage and recycling businesses struggle with air quality, ClearSpan buildings provide natural ventilation for a more enjoyable environment. Using a ClearSpan structure for your salvage business allows you to utilize natural lighting, minimizing energy costs year-round. From parts buildings, recycling sales offices, transfer stations, equipment storage and more, ClearSpan has a structure that can be customized for any salvage business need. They purchase the recycled metal from surrounding areas in Northeast Ohio and market it to steel and aluminum mills, foundries and refineries in the United States and China. The company prides itself on maintaining a clean, state-of-the-art facility in order to efficiently and cost-effectively offer a high-quality product to their customers. Vice President of Operations Tim Jones decided that a covered building was necessary to uphold the high standards of the company, while providing much needed protection from the elements during the winter. Jones explained, “Since our business has grown over the years, we were looking for something practical to store the scrap metal, while keeping it out of the harsh, inclement weather that we have. 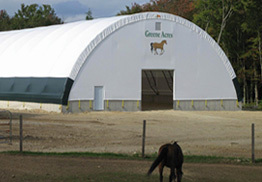 It is very important that we keep the metal clean and dry before it goes to a mill to be melted down.” After seeing a ClearSpan advertisement in a recycling magazine, Jones looked into the company and decided that three Hercules Truss Arch Buildings would be the perfect solution for his company’s storage needs. For more on Slesnick Iron & Metal and their ClearSpan buildings, visit www.SlesnickSteel.com/I&M_Home. Our salvage structures come in fabric, hybrid and metal buildings, ensuring that no matter how you plan on using your ClearSpan structure, there is an ideal option.